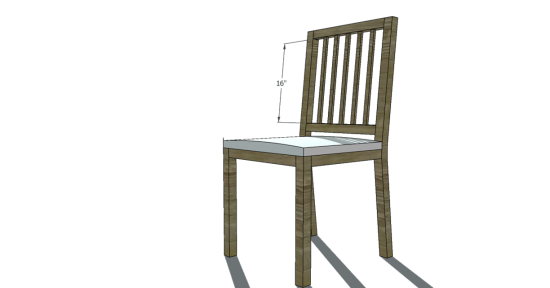 This plan is an easy to build version of my most favorite chair and this plan has absolutely no upholstery, for those of you with kiddo’s and who need to something easier to maintain than an upholstered dining chair. It should cost no more than approximately $25 to build, give or take, depending on your region. 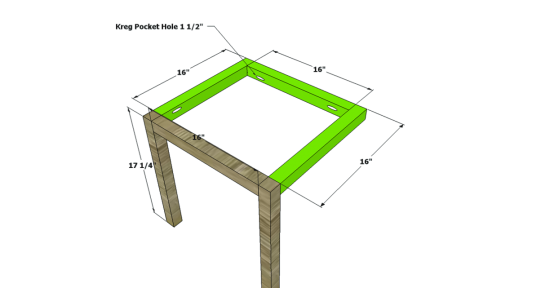 Cut your 2×4’s in the shape and dimensions indicated below. To begin, draw out the cut lines as you see them here, go slow, and be accurate. You will have the most success cutting this, with either a circular saw or jig saw. A jig saw can cut right along the lines you draw, whereas with a circular saw, you will need to stop at each change of direction and angle, and carve out the triangular piece you began with, before moving on in another direction. 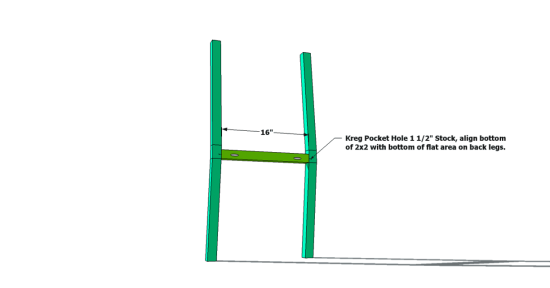 You want to be sure both legs match and that the bottom of the legs, and the 3” vertical center (where the seat will connect), line up as perfectly as possible. To ensure matching dimensions and angles, clamp the legs together after you cut them out, and sand the matching faces of both at the same time for all 4 sides. 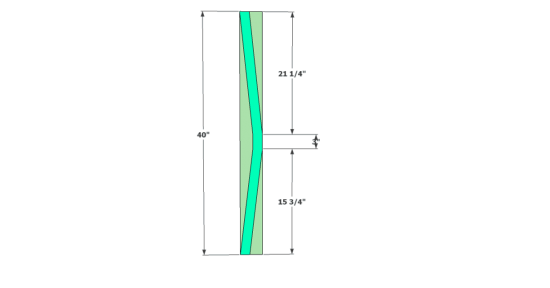 Once they are matching and sanded, connect them with the rail as indicated below. It will sit at the bottom of the 3” vertical space on the legs.. Build the front: cut all pieces to size, then place your pocket holes in the areas indicated below. Use your 1 1/2” setting and your 2 1/2” pocket hole screws. Fasten slats to the chair front from underneath, use glue and fasten up through the chair aprons, all the way around, to hide attachments. Then attach the chair front to the chair back. Use the back aprons to attach to the back legs, and secure from the inside. 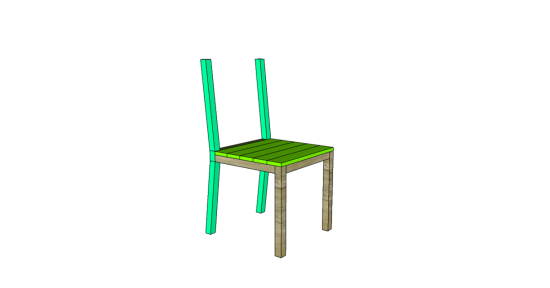 Tack on the last seat slat, your 1×2 seat slat, that should sit directly on top of the back apron between the back legs. 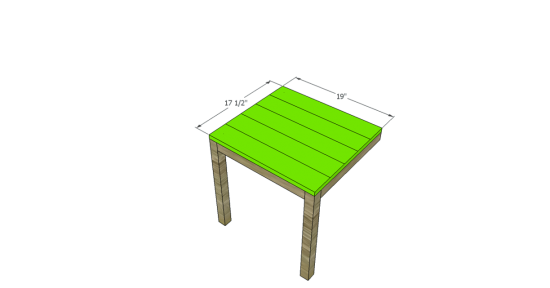 Cut your rails and slats to size, and note the slats are actually 1” longer than the dimension which will show. Create your pocket holes on the rails and drill your holes in both the top and bottom rails to house your slats. To create slat holes, mark out your drill hole locations by finding your middle, then dividing the remaining space in thirds. 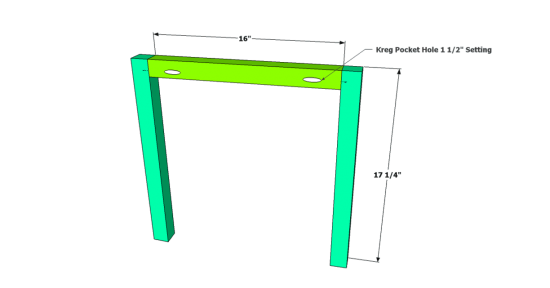 You should be placing the remaining holes approximately 2 2/3” apart. To create slat holes, use a 1/2” drill bit with a collar stop at 1/2”. This can be even a piece of masking tape marking the spot on your drill for 1/2”. This will keep you from drill farther than 1/2” into the rails. 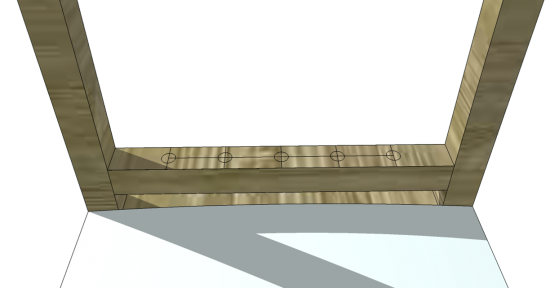 The slats are actually housed inside the rails by a 1/2” on the top and bottom and only need a bit of glue to be held in place, however if you prefer to also fasten with a pocket hole, you may. Once your holes have been drilled, secure the bottom rail in place (to the legs), drop in the slats with a drop of glue in each hole, then place a drop of glue in each hole for the top rail and turn over to set on top of the slats. Secure the top rail to the legs. **Disclaimer: Some rights reserved. Private use only. Feel Free to link to any of my plans so long as you provide an adequate link back to the appropriate post! Plans from this page are not to be used for commercial purposes or republished without the express written consent of Rayan Turner, The Design Confidential I hope to provide accurate plans, however, I cannot guarantee each plan for accuracy. Not every plan that I post has been built and tested, so you are building at your own risk. It is recommended that you have a clear understanding of how the project works before beginning any project. Please contact me if you find an error or inaccuracy so that I might fix it. / Affiliate links are used for tools and materials. The Design Confidential will earn a small commission for any items purchased using these links. Thank you for your support – every little bit counts! Hi, your plans seem to have gone missing for this dining chair.